Mongolia Sunrise to Sunset 2019 | JustRunLah! Arrival in Ulaanbaatar (UB) of participants travelling directly to UB or via Beijing (departure the day before from Europe). After arrival in UB, departure of scheduled flight to Khatgal/Moron on the Southern tip of Lake Hovsgol. Transfer via jeep and vans to Camp Toilogt. Evening arrival in Camp Toilogt. Assignment of gers and welcome dinner. Acclimatization day for participants in Camp Toilogt. Possibilities include horseback riding, fishing, trekking and familiarization with the course. Acclimatization day. Possibilities include horseback riding, fishing, trekking and familiarization with the course. Rest day. Award Ceremony and party in the evening. Preparation for add-on horse trek for those who stay on. Departure of participants from Mongolia and end of the Package. Mongolia Sunrise to Sunset takes place in Hovsgol National Park, one of the world’s most remote and beautiful National Parks in Northern Mongolia, 700km from Mongolia’s capital Ulaanbaatar. It is a week full of exploration and adventure: In the ‘ger camp’ at the shores of stunning Lake Hovsgol, participants experience Mongolia-style living in the cozy gers with environmentally friendly ‘western’ comforts including hot showers and electricity. They explore the raw beauty of Mongolia and get in touch with the culture of the nomadic population – a truly unique experience. The course is as challenging as it is beautiful: Trail hiking and running through a fairy-tail countryside and pristine wilderness. A mix of horse trails and jeep tracks along lakeside meadows, through seas of wildflowers, steep mountain treks, alpine forests of taiga and lush green hills. Elevation: Race start: 1,625m; 42km race: 2,255m elevation gain/loss; 100km race: 3,365m elevation gain/loss. Cut-off times: 18 hours for both marathon and 100K distances. 8 hours at 42K mark for 100K runners. 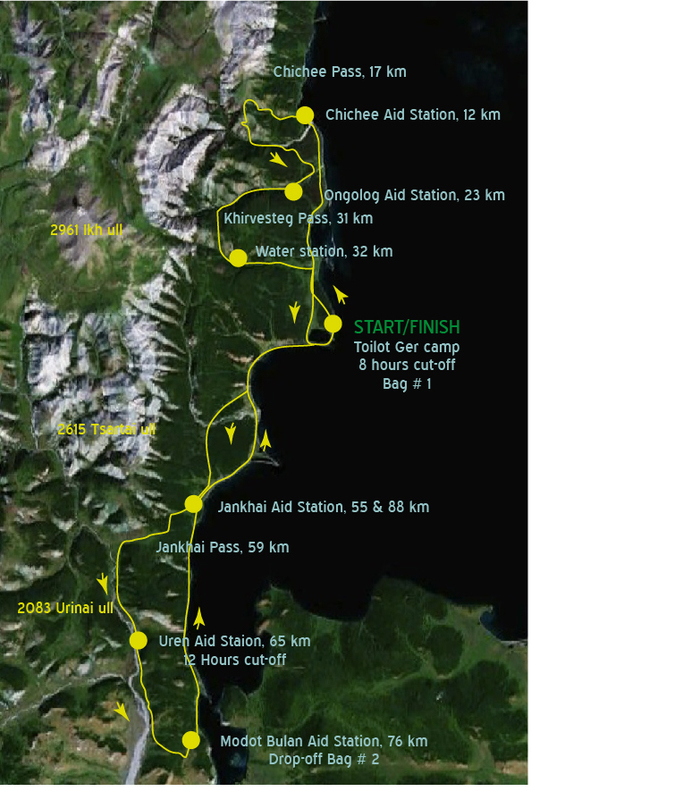 Aid-stations: Manned aid-stations with local doctor every 12-15km. Western race doctor on call at race HQ.